One of the best things about following independent wrestling (besides all the awesome talent and matches) is watching people develop and discovering tomorrow’s stars today. Here’s a look at three wrestlers who haven’t quite fully “broken out” yet, but are tearing it up, are definitely ready for the next step in their careers and will soon. It feels odd to list Evolve’s current champion and a ten year vet as an “up and comer,” but despite his status and experience I still don’t feel Timothy Thatcher’s as well known as he should be. He’s the most compelling in-ring performer I’ve seen in a long time. EVERYTHING is measured, executed carefully, and believable. He knows how to draw the crowd in to hold for hold wrestling, and the secret is that he’s always fighting. Each hold, strike, suplex, etc is clearly an attempt to get closer to winning the match. It’s a subtle but incredibly important thing that a lot of the Evolve roster understands and does well, but Thatcher’s perfected it. This ability has allow him and compatriots like Gulak and Biff Busick popularize a strong grappling based style that gives Evolve even more depth and variety to its cards. It’s kind of hard for me to believe he’s only been in Evolve for a little over a year given what a year it was. Thatcher made an immediate impression against rival Drew Gulak and very quickly became I guy I ordered shows to see. He’s had a ridiculous number of matches that I thought were the best of their particular show, including phenomenal battles against Tommy End and Chris Hero earlier in 2015, and a title defense against Zach Sabre Jr. that was just unreal. Evolve has a great champion in Thatcher, and I can’t wait to see how much more he can accomplish. “The Party Peacock” own his character like no one else I’ve ever seen, making an absurdly over-the-top gimmick amusing and likable instead of annoying. It was an absolute treat seeing him live at an ROH tv taping this past June. He’s on from the moment he steps out of the curtain to the moment he goes back, including little things like giving the occasional male fan a back of the hand caress across the side of the face (like he does with his boys during interviews) instead of high fives. I unexpectedly earned that particular greeting myself by calling out “you’ll get them next time Dalton” as he walked back from an unsuccessful effort in a six-man match. I also saw his expansive cape get momentarily caught in the stairs behind him on his way to the ring. Dalton noticed it tugging on him and spun around with an emphatic “what happened? !” Presented with no immediately apparent answer (as his boy had already released it) he gave a big sigh and looked puzzled with that half vacant stare of his. When greeted with a call of “don’t worry, it’s already fixed” from a fan he exclaimed “that’s right!” and went right back into strutting mode. It’s a ridiculously small thing, but to me the ten second exchange nicely highlights his complete commitment to staying in character every single moment. I haven’t seen as much of his ringwork yet as I’d like, but what I’ve seen has been great. He knows how to incorporate his eccentric character and antics into matches without ruining them by going too overboard or missing the point of it being an athletic contest. Dalton Castle’s a strong wrestler with phenomenal charisma and I predict big things for his future. Side note: Castle’s tweets are easily the highlight of my twitter feed. They’re generally in character and hilarious. My favorite so far was “Me in a hot dog eating contest at Coney Island… I don’t fully understand the rules” with a picture of him performing a German suplex. 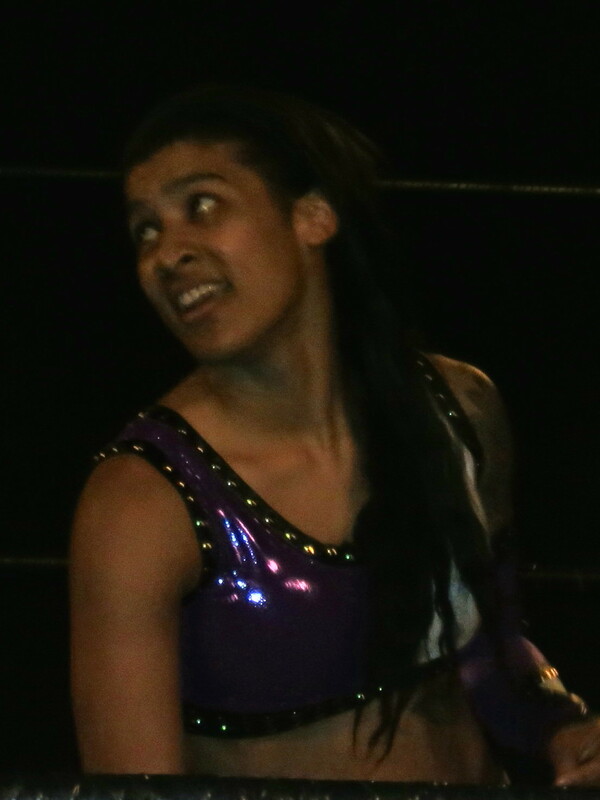 I’ve seen Nicole Savoy at two Shimmer weekends now, and at both I and other Shimmer regulars came away talking about have impressive Savoy was and how much we wanted to see her come back. She has a natural presence that makes you take notice right away, which gives her an air beyond the relatively few years she’s been in the sport. But more than that, Savoy has amazing instincts and mannerisms. She’s friendly and appreciative outside of the ring, but when she’s “on” and in the ring she’s a complete, consummate heel. A friend of mine told her “you make me want to punch you in the face, and I mean that in the best possible way” (and of course she was thrilled, because it means she’s doing her job properly). She innately knows just how to act, move, and carry herself for maximum effect. Beyond all of that, Savoy is also excellent in the ring. She’s more than held her own both against Shimmer mainstays like Evie, Heidi, Yim and Lufisto, and in opportunities to step into the ring with international superstars Misaki Ohata and Yumi Ohka. She gets better and better every time I see her. Nicole Savoy has all the tools so to speak, and right now it really looks like the sky’s the limit for her going forward. Hope everyone enjoyed my look at three of the best on the indies, and definitely check them all out if you get a chance. There are plenty of excellent wrestlers in the ranks right now, and I’ll be back to feature more soon.